Two month ago, when p2p lending service Isepankur opened up to investors from all EU countries, I started lending there. In this post I look at the status of the portfolio I have built so far. I have deposited 4,000 Euro (approx. 5,200 US$) over the past weeks. The account currently has 254 Euro in cash, 215 Euro waiting in bids on loans to close and the majority of 3,580 Euro is invested in loans. I invested usually between 10 and 35 Euro per loan. The average interest rate of the loans is 25% and loan terms are between 1 and 36 months with most loans running for 24 months or longer. Most of the investments were done using the automatic bidding feature: About two thirds of the loans are fully funded by automatic bids the minute they appear on the marketplace. It is therefore necessary to use the automatic bidding, or these loans will be missed investment opportunities. So far nearly all repayments came on time. Of the few who missed a payment date, all but two repaid the next day. Currently only one loan (10 Euro) of my portfolio is a few days overdue. One loan was fully repaid early after only one month. In December I have scheduled repayments of 149 Euro which consist of 91 Euro principal and 58 Euro interest. In January – with more loans reaching first repayment date – repayments will rise to over 250 Euro. 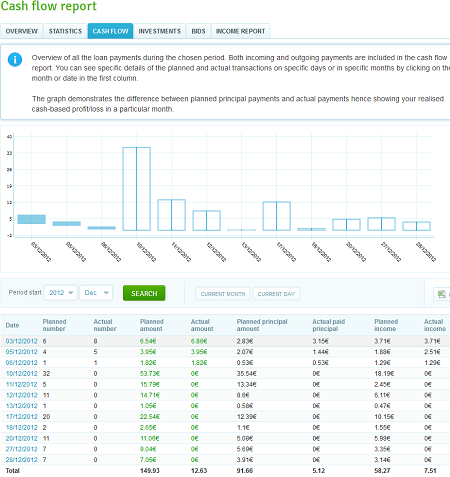 Isepankur offers monthly and daily charts forecasting cash flow. The portfolio management has a statistics section that daily calculates the return on investment. While it is much to early to get anything meaningful (my portfolio is just to young) I show a screenshot of the current result below. Isepankur calculates Return on Investment based on money that is invested in loans only. The cash sitting without interest in the account is not taken into the calculation, so that it is actually returning a higher value than if I would use XIRR to calculate ROI. 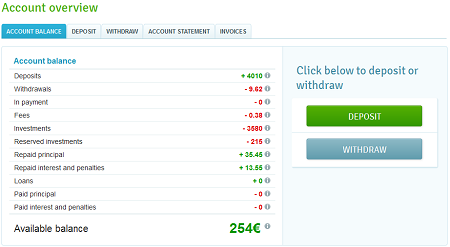 I am pretty happy with the user experience so far and I plan to reinvest any repayments and to deposit more funds. I will also raise my maximum bids on loans of the best credit grade from 35 to 50 Euro per loan. Isepankur has achieved accelerated growth of loan volume in the past two months and it looks like December will be a good month again. Thank you for interesting article. Very much interested to see new updates. interesting – what risk scores you accept for investments? only 1000 or less also? Mostly 1000. Some 900. Very few experimental 5 Euro bids on 600 to 800. Are you sure that there will be no Estonian tax on income?